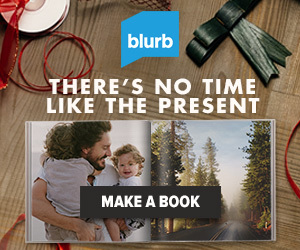 If you’re still looking for gift ideas for those loved ones who are hard to buy for, check out Blurb.com’s great deal on printed books. You can make all sorts of custom books, letting your creativity shine through. Plus, you’ll create a sure-to-please keepsake that’s easy to wrap and/or mail. Check out the wide variety of choices at Blurb.com and save 25% off with no minimum purchase required. Get 25% off printed books at Blurb using coupon code LASTCHANCE25, expires December 17. Gift for friends: Make an Instagram book or a Facebook Photo Book! Blurb makes it quick and easy to turn your social media photos into custom photos books for your special friends. Gift for clients: Make a year-end portfolio! Make a custom portfolio out of your best work and send it to all your clients, helping to keep you in mind for their 2016 projects. Gift for the whole family: Make a family cookbook! Preserve your family’s recipes. Ask around to find out whether relatives can contribute their favorite recipes and photos of their delicious dishes. Gift for the family genealogist: Make a Blurb Family History Book! I am my family’s genealogist, and I love collecting more photos of my ancestors. Gift for the grandparents: Make a photo book with pictures of all the grandchildren, or a Blurb Baby Book! Most grandparents can’t get enough photos of the grandkids to show off to their friends. What are your favorite gifts to buy for people who are hard to buy for?